Packaging MEMS devices can be more challenging than making them, especially if packaging has not been considered from the start of the design process. 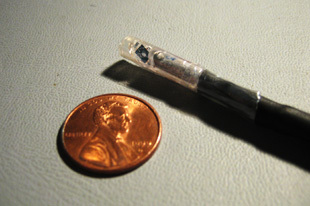 Unlike standard electronics, MEMS devices often require the ability to sense and interact with the outside world via ports, such as optical windows, pressure channels and fluidic connections. 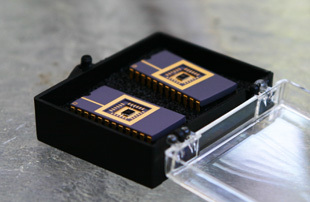 Furthermore, the fragile nature of released MEMS devices necessitates special handling capabilities. AdvancedMEMS has experience designing packaging for some of the most demanding applications. We have also developed a proprietary packaging technology that is inexpensive in volume and allows for maximum flexibility in both design and application. Our team is familiar with both wafer level bonded packaging techniques as well as individual die packaging processes. We have the ability to quickly package your MEMS devices in industry standard DIPs or other commercially available packages, as well.